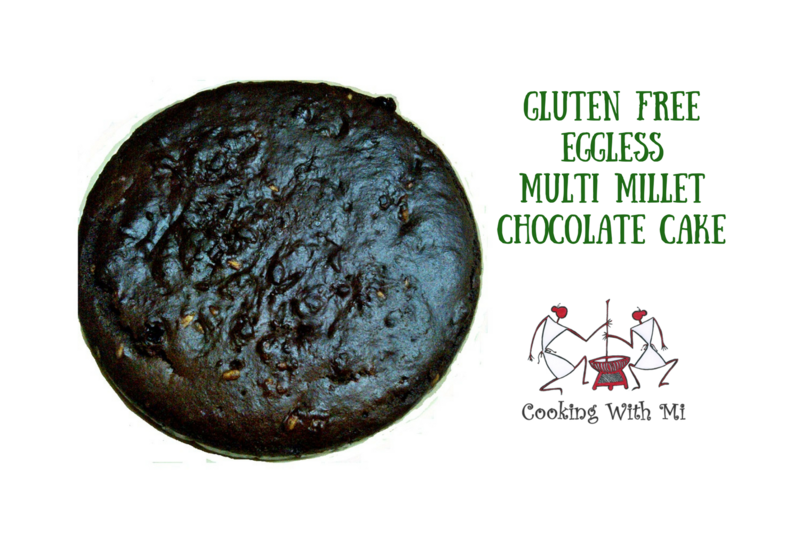 The first time I made this gluten free eggless multi millet chocolate cake was a couple of years ago, when we had a bunch of young adults at home and interesting meal plans had to be made. And of course, cake became an essential, especially since I was expecting him home for the break and everyone was waiting to wish him a happy belated birthday. With all the activity at home, I didn’t really plan the cake, but I was confident I could easily make a diabetes friendly cake – because, let’s face it, I was obviously not going to sit and watch while everyone enjoyed cake – nor was I going to fuss when the boys insisted I had a piece too. Why, this way I’d have two. Also – cake is easy to bake and can be carried over for a couple of days. I hoped. So, I fell back on my tried and tested multi millet chocolate cake. Imagine a birthday cake – even a belated one – without chocolate! I shoo-ed the boys out and got started. What a mouthful! But so was the chocolate cake! I got two large bowls together, one for the dry ingredients and one for the wet. 4-5 dates, chopped-mixes easier when coated with the dry ingredients. 1 cup thick home-made yogurt instead of 3 eggs. Also, the flaxseed in the multi millet flour would help. 1 cup powdered jaggery (instead of 1 and ¼ cup sugar) – not dry, but mixes better with the wet stuff. Then I mixed the wet ingredients in the wet bowl. Now is a good time to preheat the oven for 10 minutes at 180 degree Celsius, as it is enough time to get the cake pan ready. For me, that is. You may be quicker – so time it as per your convenience. I greased my almost 9” cake pan (actually a pressure cooker container that’s perfect for cakes) and brushed it with flour. Of course my phone rang – my friend called. I told her I was busy baking – and she suggested adding a handful of roasted sunflower seeds and black raisins. Good idea, I thought! I folded the dry ingredients into the bowl with the wet mix until it was a smooth consistency. The batter went into the cake pan just as I heard the loud “ping” of the oven, letting me know she was ready. I placed the cake pan in a tray on the rack, just in case there were spills – because I did not fancy scraping off crumbs. I set the timer at 25 minutes in “bake” mode and decided to start getting dinner ready. 15 minutes later, the aroma of baking – which is probably how it is like in heaven – began to fill the house. Nice welcome, I thought, for the boys when they returned home. Another 15 minutes later, when my pressure cooker let out her first whistle, I heard the oven announcing the cake was done with a “ding” (yeah, I like to think so, anyway!). With a prayer in my heart, I waited 3 minutes and opened the oven. Cake looked ready. I gently eased the tray out remembering to wear my oven mitts – and placed her on the counter. Apologizing, I slid a knife into the cake… yes, she was perfect. It was time to flip her over on the cooling rack – and flip her right side up – and I did. Yes, everyone loved the cake, thank you. Multi millet flour is gluten free and has an interesting taste that complements chocolate. The cake was low on calories – and diabetes-friendly – good for me! I had some batter left over and adding a little more multimillet flour, I brought it to soft dough-y consistency and gently rolled them into 2-inch balls and flattened them. And microwaved the little babies after sprinkling a few pumpkin seeds on top. See what I got! They weren’t half bad with a big mug of well-deserved coffee! Life is good. Particularly if there’s chocolate cake.